Dezeen Watch Store: new limited-edition 104 Series watches by Uniform Wares have arrived at Dezeen Watch Store in two updated colour combinations. Only 100 of the 2014 edition of the unisex timepiece were produced by the London-based watchmaker, 25 of which are now available at Dezeen Watch Store. The original 104 Series was created as a revision of the 100 Series – the first watch created by Uniform Wares, who have gone on to become become one of Dezeen Watch stores' most popular brands – and is available in walnut/brown, blue/grey and black/black. 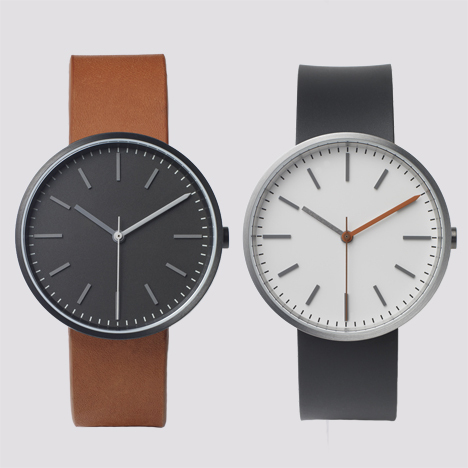 For the 2014 limited edition design, Uniform Wares released a new brushed/black colour pairing with rubber strap and a black/tan version with calf-leather strap. "Our straps are a very important part of our offering and something we feel is often overlooked or somewhat of an afterthought with many brands," said Uniform Wares design director Michael Carr, in a recent interview with Dezeen Watch Store. "We have been very happy with the straps we have made with previous models, but as with everything, we strive to improve where we can and started to see limitations to what could be achieved." The watches feature a Swiss-made, 5-jewel Ronda movement and 37mm stainless steel case with satin-brushed bezel, as well as hand-applied batons that mark the hours.